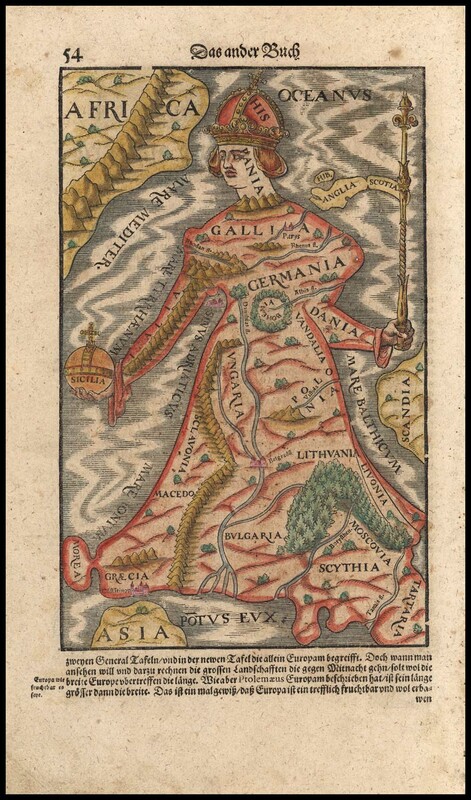 In the course of putting together my summer graduate seminar on the expansion of Europe this past weekend I reacquainted myself with some digital map collections on the web. 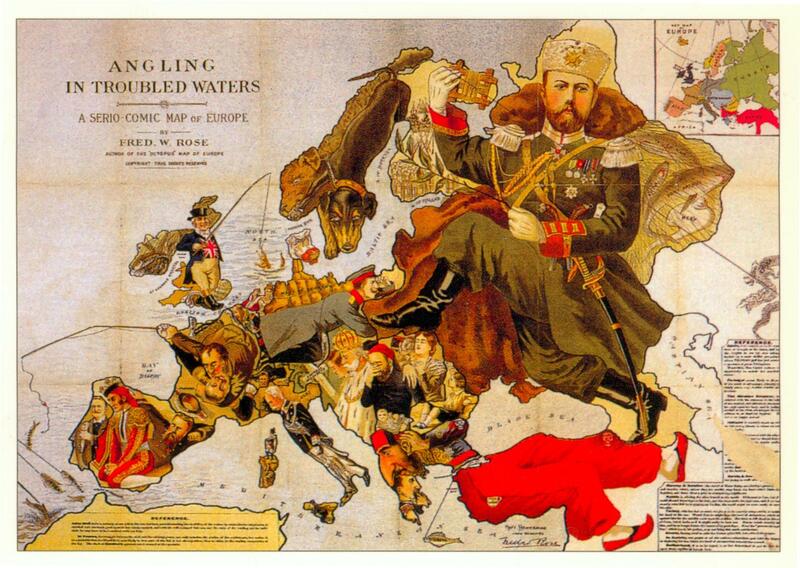 Maps provide an accessible entryway into this topic, in every era of European expansion. The shift from conceptual to more realistic cartography in the early modern era is a very evident and important trend, but early modern mapmakers retained a bit of whimsy when they produced maps in the form of plants, animals and humans in the sixteenth and seventeenth centuries. 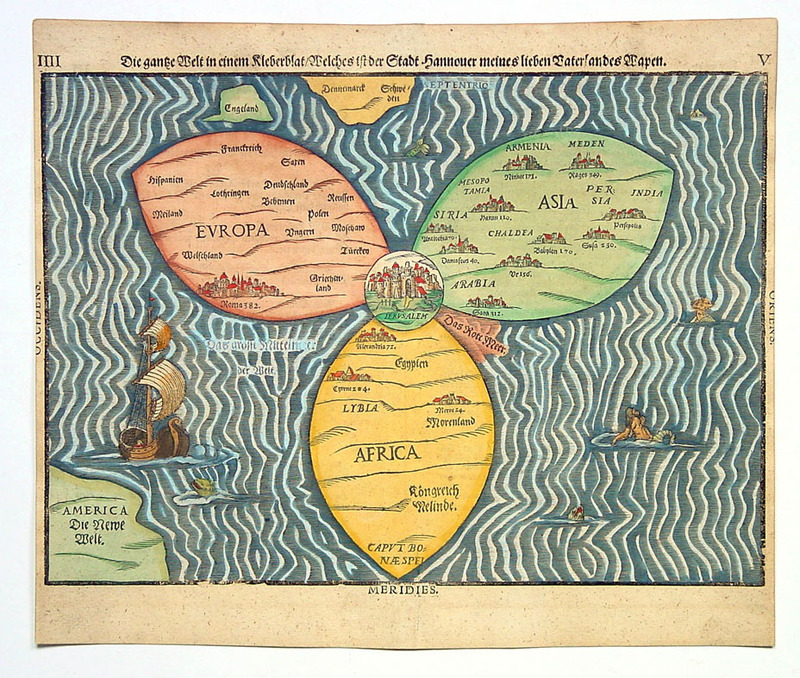 The maps contained in German theology professor Heinrich Bunting’s Travels according to the Scriptures (1581) are very popular with my students and with the blogosphere: the known world as a clover leaf, part of Asia as the flying horse Pegasus, Europe as the classical virgin Europa. This is still very conceptual geography; the clover leaf map is merely a new version of the medieval T-O map, in which the world is inhabited by the descendants of Noah dwelling in Asia, Africa and Europe. Jerusalem is at the center of the world as it has always been. Even though it is almost a century after Columbus, Heinrich’s “world” map only references the eastern hemisphere. 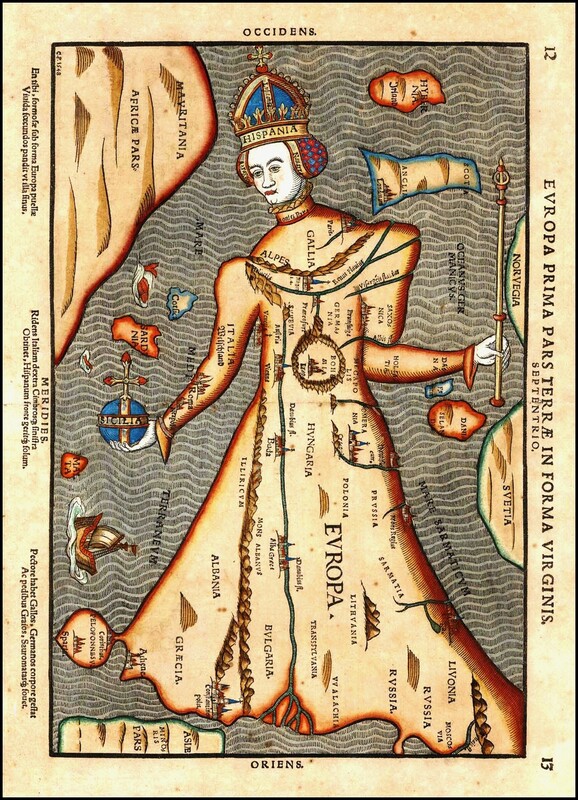 His Europa map was stolen from one of the most popular books of the sixteenth century: Sebastian Munster’s Cosmographia, first published in 1544 and issued in many editions by the end of the century. This is what these new, colorful, fantastical maps are all about: competition in the new age of print. 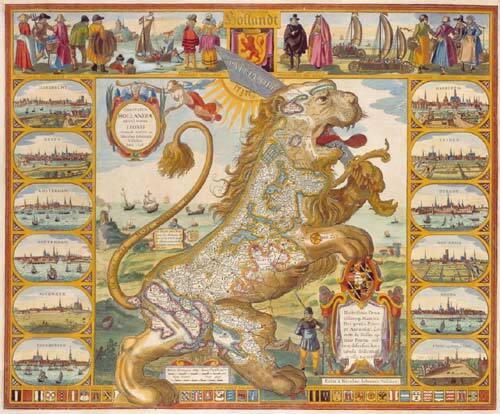 Another lively early modern map is the “Dutch Lion” map (Leo Belgicus, Leo Hollandicus ) issued in a succession of variations from the late sixteenth century, contemporaneously with the Dutch Revolt against Spain. The rebellious Dutch provinces are shown in the form of a lion, roaring in the face of the powerful Spanish Empire. 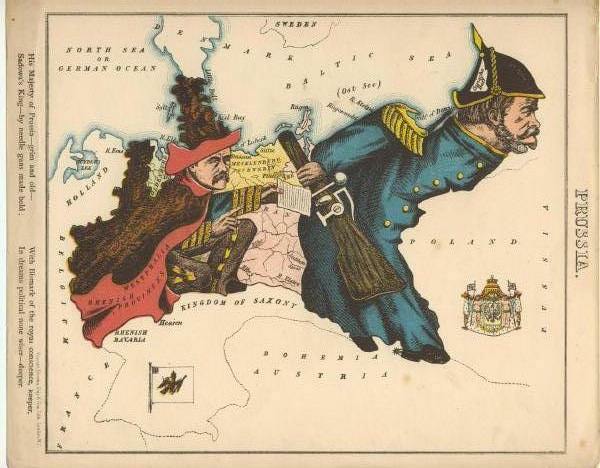 In L’Europe Animale, Germany is a sly wolf waiting to pounce, while the Angling map personifies the nation with its militaristic ruler, Kaiser Wilhelm II, who is looking over the horizon. The great big Russian bear and Tsar Nicholas are pretty intimidating as well. 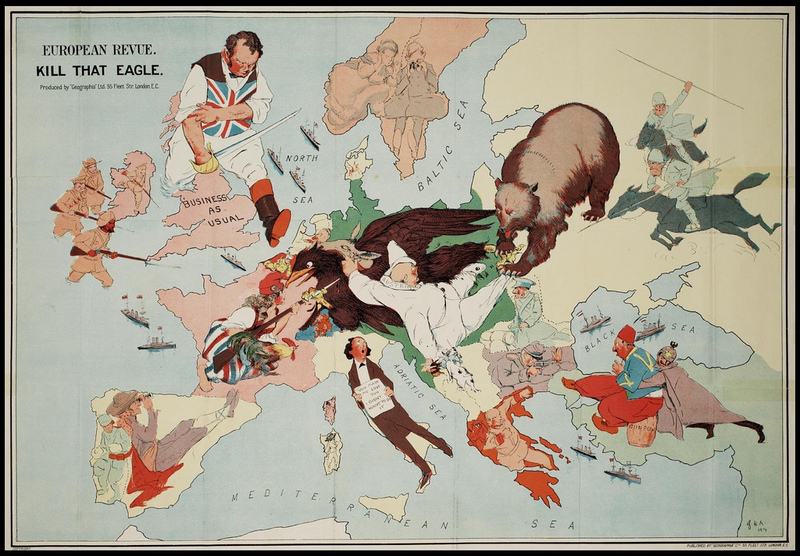 The end result of all this animosity was of course World War I, and BibliOdyssey has a great post on the jingoistic satirical maps of the Great War here, including the English map “Kill that (German) Eagle” from 1914. This entry was posted on Tuesday, May 24th, 2011 at 7:16 am	and tagged with advertising, Nineteenth Century, print culture, Renaissance and posted in History. You can follow any responses to this entry through the RSS 2.0 feed. Really great post and I haven’t seen any of these maps before. I really love the elephant WWF ad too. It would be v interesting to see what an artist would come up with for countries/politics of today. How wonderful. Thanks for showing us these maps. Love it. LOVE the Dutch lion map — only wish I had more time to really take in all the details. Such cool stuff! Really nicely done, thanks for sharing. Found on wordpress homepage! Very cool selection thanks for sharing. Glad you included the elephant and congrats on being Freshly Pressed. Those maps are fascinating, thanks for posting them! Are really nice. I haven’t seen these maps before. I love the colorful of the maps. I love it specially the first three maps. 100% awesome! I’m a big fan of maps, typography and design, these hit on all those which means I’m in love with them all! Great post. Fantastic post, and those maps are amazing – I knew that this sort of thing existed, but not to that sort of extent. Really interesting stuff, thank you. As my old theology prof. used to say: show me the maps on your wall, and I’ll know all about you. These are great! 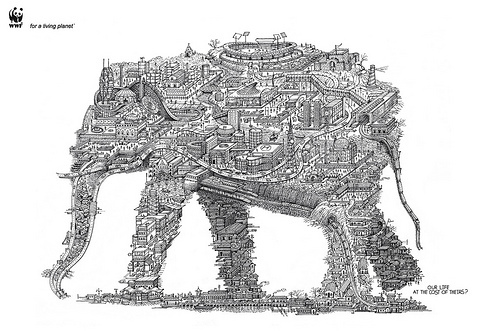 I love the elephant map the best. By the way, I saw your post on Freshly Pressed. Beautiful maps, but I wouldn’t want to try to navigate with them! Wow. These maps are amazing. I think it might be harder to read than a normal map though. Hahahaha! Those were spectacular! Talk about bizarre. These maps are beautiful, it’s amazing to see how people saw the world so long ago and what was important at those times! What a great inspiring way to teach maps and geography, and make them easy to remember. The true map should be placed alongside each one. This is a beautiful collection of maps. Using maps for interior decorating has become even more popular during the past several years. Such maps are timeless, elegant and will blend in with any decorating style, no matter if contemporary or classic. Wow is that first one a map, or flower. As an artist, I just love all of these but as a geographer, I can’t help but to be a bit mortified by the accuracy. i love maps…have a few framed in my home. but nothing like these…they’re amazing! thanks for sharing. i’ll have to look into getting some more cool prints. Facinating! Obviously back in the day impressions were more important than accuracy…..lol. What a wonderful post. I never would have imagined that such things existed, even though in some cases they aren’t too far off from modern-day political cartooning. The maps are incredibly beautiful. So much thought and time required to produce these beautiful works of art. I find that I’m more and more drawn to ancient ways of thinking and acting. The slower pace required to achieve many things in our ancient cultures, is somehow enticing to some of us, in our society today. Thank you so much for sharing these with us. They are so fascinating and cool! I love how the depicition of what was occurring historically is “mapped” out artistically. What a wonderful collection of maps to look at and to savor!! Thanks for pulling them all together for us to enjoy. And congratulations on being Freshly Pressed. NIce research, the maps are gorgeous. I’ve never seen anything like this. Thanks for posting. Wow, these are fantastic and beautiful! I have some prints of old maps in my room but none quite as fascinating as some of these. It’s amazing to see how people used to view the world and their place in it. Thanks for sharing! Fascinating and cool. Always been a huge fan of old maps, and although I probably don’t know my way around them like you do, I’m captivated by them as snapshots of our collective image of the world around us, and ourselves. Congrats on being Freshly Mapped….oops, I mean Freshly pressed. 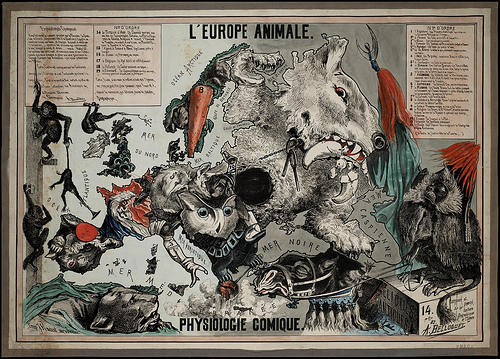 Thank you for collecting these very interesting old maps- the one from L’Europe Animale is an epic story in itself 🙂 it’s so interesting how they’d built in their self-image projections into the map. How stunning – illustrated maps bring places alive in our imagination far more than our boring modern day atlas versions! Super like!!! Nice maps.. loved them esp. the elephant one! I love maps, I have a collection. Yours are very cool! Hello I found this post so good that I reblogged it – as my blog has only my family and friend visitors it probably won’t matter. I just have to tel it here. Funny maps, anyway! I do really, really, really, really give two thumbs up for this post. Awesome. I like your page and your entries!! look forward reading more from you!! Cheers!!! Le propos de l’auteur, Donna Seger est une femme et un historien est de présenter une série de cartes « modernes », depuis la renaissance mettons, mais dont l’idéologie, la géographie mentale, reste prépondérante. 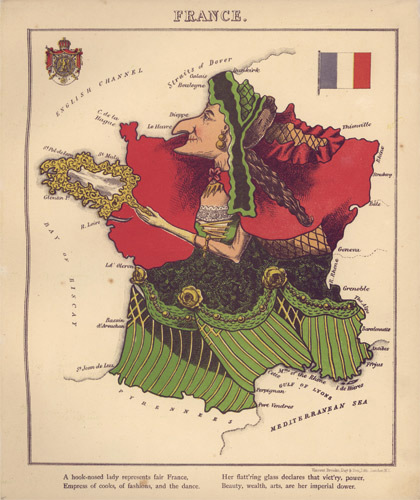 Elle parle de carte conceptuelle. Le blog et l’article valent la peine d’y jeter un coup d’oeil. C’est à la fois drole et instructif. translation (a try) : maps come alive ? the purpose of the author, Donna SEGER is a woman and an historian is to present a sequence of modern maps, say after the Renaissance, wich ideology, mental geography, is the main matter. She speaks of conceptual map. Blog and article are quite awesome. It is fun and didactical all-in-one. You are welcome. Thank you to edit a so wonderful blog. Wow, awesome blog layout! How long have you been blogging for? you make blogging look easy. The overall look of your website is great, as well as the content!. Thanks For Your article about Maps Come Alive | streetsofsalem . I am extremely impdessed with your writing skills and also with the layout on your blog. Anyway keep up the nice quality writing, it is rare tto see a nice blog like this one today.